Since therefore Christ suffered in the flesh, arm yourselves also with the same intention (for whoever has suffered in the flesh has finished with sin), so as to live for the rest of your earthly life no longer by human desires but by the will of God. You have already spent enough time in doing what the Gentiles like to do, living in licentiousness, passions, drunkenness, revels, carousing, and lawless idolatry. They are surprised that you no longer join them in the same excesses of dissipation, and so they blaspheme. But they will have to give an accounting to him who stands ready to judge the living and the dead. For this is the reason the gospel was proclaimed even to the dead, so that, though they had been judged in the flesh as everyone is judged, they might live in the spirit as God does. Grace is not free. There is always a price paid. Deitrich Bonhoeffer may have helped win the term “cheap grace”, but the concept, and the question that drives it are far older than this 20th Century revolutionary of the faith. That question is: How do the forgiven act? In more theological circles the question has been narrowed down to: Do Christians sin? John writes about this. Paul writes about this. Peter writes about this as well. In all accounts, there is an expectation that our acts of sin and rebellion against God will cease. If they did every time, there would be no need for the question. Since they do not, we all typically start splitting hairs, semantics, doctrines, and churches right at this point. We split passionately because we do not know how God will judge us for sure, but we think and feel our own salvation depends on us being “right’‘. Thus, we as churches fall for the same adage we often tell newlyweds: You can either be right or be married. That sin-focused view of faith ultimately leads down a road of Self-condemnation and/or Self-justification leaving no one happy or in relationship at the end of the day. Can Christians sin? Yes. We all know it and most of us prove it daily. The issue is not sin or our apparent vulnerability to it. the issue is that we are asking the wrong question. It is not that our sin does not matter. Everything matters. It is that grace matters too and anytime we find ourselves stuck trying to choose only one or the other, we have lost track of the only hope we have. 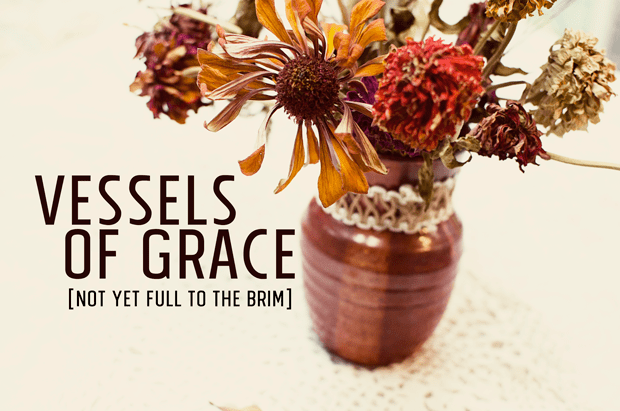 Either we are vessels of God’s grace, or we are not. Do you carry the grace of God in you? If so, what difference is it making in your life today?